Welcome to Class Ten: The Beginning. Below you will find the materials for this class session in the suggested class progression. You can use these materials to lead or host a study-group or workshop. To download the materials, click the buttons and open the downloaded files. Click the links below to access the readings for Class Ten. 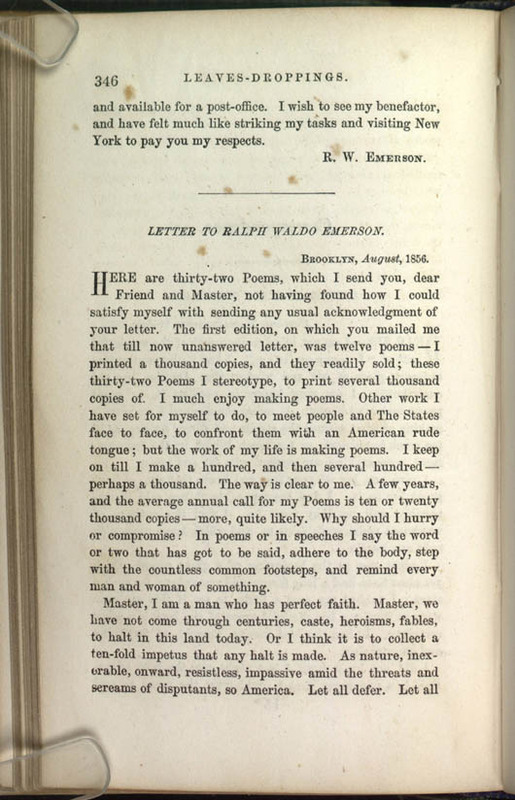 Whitman Web: Section 44 of "Song of Myself"
Whitman Web: Section 45 of "Song of Myself"
Whitman Web: Section 46 of "Song of Myself"
This is a selection of archived content from the Walt Whitman Archive. The following materials are related to the class ten video and readings. Click the images to expand them. This is a collection of discussion questions based on the video, readings, and archive materials of Class Ten. You can use these questions to lead a discussion of the class content. These discussion questions have been collected from the WhitmanWeb pages linked above under "Review the Readings."